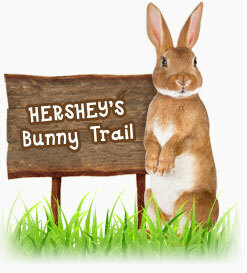 #Giveaway #RC Celebrate Easter With Hershey's! Ends 3/19 CLOSED!! With Easter coming soon, it is time to get out those Easter Baskets and fill them up with all kinds of Easter goodies. One of my favorite goodies that I still enjoy getting each year is the Hershey’s candies. I love the different chocolates and of course the Jolly Rancher Jelly Beans. A few weeks ago I was sent a great basket filled with Hershey’s goodies and I did a post which is now being featured on the Hershey’s Bunny Trail along with some other great posts from some really great bloggers! Well, since the wonderful people from Hershey’s are already getting things ready to celebrate Easter, they would like to help one of my readers get their Easter celebrations together as well by sending one of my amazing readers some great Hershey’s Easter products!! Previous Post Tips To Help Freshen Your Finances This Spring! I love the Road Rally Egg Hunt craft idea! Entered H&R Block AMEX GC giveaway, too! I like the Coconut Marshmellow Nest recipe the best. Thanks! I like the Easter Chick bags in the craft section. I like the combination of peanut butter and banana. So when I saw this recipe I knew I have to try it. The Lemon Coconut Pixies looks yummy. The craft idea I like best is the HERSHEY'S Foil Egg Wreath! I love the recipe for Raspberry Chocolate Swirl Cheesecake, the best. I also entered the Kohl's giveaway! The Baseball Basket is really cute! I love the black eyed susan cheesecake! Chocolate Swirled Cheesecake looks so so good. i like the idea of personalizing the hershey peanut butter eggs. so simple but really pretty and adds an extra touch. The chocolate cheesecake sound yummy. I entered the H&R Block $50 Gift Card giveaway. I like the Flowerpot Basket. I entered the 3 in 1 Bassient and Kohls giveaway! There are so many recipes that I know would be delicious. I think I'd like to make the Butterscotch Crescents to eat on Easter morning before we go to Church.Thanks for the giveaway! i plan to try the jolly rancher eggs! too cute! The classic Easter basket is nice. The Easter Basket Cupcakes look delish! I think I want to make some Chocolate Macaroon Bars. The Hershey Mice are adorable! My niece will love making them! Also entered the $50 Gift Card + H&R Block At Home Premium Edition Software Giveaway. I love the Pot O Posies craft, so cute! The Easter Basket Cupcakes. Even tho my kids are older I still love to do these kinds of little things for them. Peanut Butter Bunnycakes Recipe looks awesome!!! I like the Peanut Butter Easter Bonnets RecipeThanks! I'd like to make the easy peanut butter chip pie. I love the foil wreath craft! Coconut Marshmallow Nests look cute and yummy! The Velvety Chocolate Cream Pie sounds delicious!!! White Chip Fruit Tart looks delicious! I'd like to make the White Chip Fruit Tart Recipe. I love the HERSHEY'S Foil Egg Wreath. I love chocolate, peanut butter and banana and the recipe was brilliant. I like the Chocolate-Filled Breakfast Crescents Recipe. The Personalized Reese's Peanut Butter Easter Egg! The chocolate almond macaroon bars sound so good! Easter Basket Cupcakes…I am going to try making those! 🙂 Thank you. I love the Coconut Cake Nests recipe. The Peanut Butter Chip & Banana Mini Muffins look amazing! I love the Black-Eyed Susan Cheesecakes! I like the Peanut Butter Bunnycakes Recipe On the website. I like the foil egg wreath!